Academy award-nominated actor James Cromwell and I were recently arrested for protesting at a meeting of the University of Wisconsin Board of Regents for its failure to take action to end horribly cruel and wasteful experiments on cats at UW-Madison. UW’s response has been to distort, deny and dismiss well-documented cruelty in its laboratories and attempt to silence dissent about the issue. Despite UW’s shenanigans, the truth is out and these barbaric studies should end now. 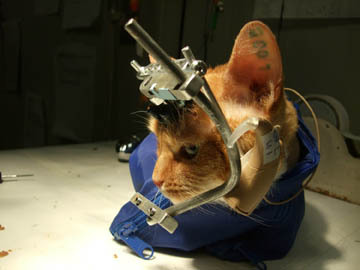 According to documents that People for the Ethical Treatment of Animals obtained from UW through a public records request and subsequent lawsuit, experimenters cut cats’ heads open, screwed steel rods to their skulls, implanted electrodes in their brains, and placed metal coils in their eyes. Some cats were deafened and had electrical devices implanted into their ears. The cats were then starved for up to six days straight because when they’re so hungry they will cooperate in experiments in exchange for a morsel of food. As a result of all this trauma, nearly every cat PETA obtained records on — including Broc, Cali, Daisy, Mama Grey, Marble, Patches, Slinky, Tiger and Timmy — suffered from constant infections, illnesses, physical pain and depression. This was graphically documented by UW staff in photos they never imagined the public would see and fought tooth-and-nail to keep secret. The images depict a cat called Double Trouble with a metal post and wires protruding from her head. One of her eyes is half-closed because her face was partially paralyzed by an apparently sloppy surgery. Each horrifying detail above is taken directly from records that were written in UW staff and faculty’s own hands, and captured with their own camera. A former UW veterinarian who worked in this laboratory has also confirmed PETA’s allegations of abuse. Experimenters eventually killed and decapitated Double Trouble because she became too sick to continue and the devices implanted in her head didn’t work. While PETA objects to these experiments because they’re cruel, they’re also bad science. UW experimenters told colleagues that the project was a failure. Indeed, the experiment has never been published in any scientific journal, nor has any other cochlear implant experiment on cats from this laboratory. Yet UW has defended itself by deceptively claiming the suffering caused to Double Trouble has made important contributions to human hearing research. Hundreds of thousands of U.S. citizens, Wisconsin residents, and taxpayers have urged the federal government and UW to end this publicly funded cruelty to animals. UW’s strategy for dealing with this exercise of democracy has been to block emails from the public, to diligently delete thousands of critical messages from its Facebook page, and to remove the contact information for Board of Regents members from its website. I used to live in Madison and I’ve learned that the school will go to great lengths to shield itself from criticism. In 2006, following open records requests by myself and the Isthmus newspaper, UW destroyed 60 boxes of videotapes showing footage of experiments on monkeys. In 2011, PETA and Madison’s Alliance for Animals sought to have UW prosecuted for experiments in which they killed animals by decompression and forced mice to fight in apparent violation of state law. UW responded by successfully lobbying to completely exempt its experimenters from all state cruelty to animals statutes. UW is more than happy to take our money to torment animals. But, unless you have some good lawyers, don’t start asking questions about it. Jeremy Beckham: UW’s cruelty to cats should be stopped : Ct.
happens to them after being experimented on? relevant to humans and do not reliably predict outcomes in humans. developing and promoting alternatives to this testing. to replace the use of laboratory animals in experiments. Jerry Polder: Good alternatives to animal testing available : Wsj. In response to actor James Cromwell’s protest at a Board of Regents meeting, the University of Wisconsin claimed the People for the Ethical Treatment of Animals’ allegations of the mistreatment of even more cats in one of its laboratories were “unsubstantiated.” Yet the troubling allegations in the complaint to the regents were based directly on UW’s own internal records chronicling sick and dying cats and on horribly upsetting photos UW faculty took of their own experiments and expected no one to see. How about some honesty, for a change, from our administration? The issue here is not that the extensively documented, troubling allegations are “unsubstantiated.” They are very true. The regents just don’t care. Gina Stuessy (gstuessy@gmail.com) is a Madison resident who graduated from UW with a degree in biomedical engineering in 2008. The Badger Herald · Research cruelty well documented. Madison – James Cromwell, the Oscar-nominated actor who starred in “L.A. Confidential” and “Babe,” was arrested Thursday morning with protester Jeremy Beckham of PETA for shouting during a University of Wisconsin System Board of Regents meeting, calling campus research on cats torture, not science. The two burst into the meeting room as a UW System official was beginning a report to the regents about student success predictors of whether the system is on target to reach its goal of producing 80,000 more degree holders by 2025. Regents appeared taken aback, but no one responded to Cromwell and Beckham. They held two large signs showing a cat named Double Trouble with metal implanted in its head at a UW-Madison lab, while shouting about the treatment of cats. “This is not science, this is cruel,” Cromwell said. Beckham, a PETA spokesman who lives in Salt Lake City, Utah, went limp and dropped to the floor in front of the regents. Cromwell said in a telephone interview the meeting was being streamed, a plus he and Beckham hadn’t known about. Beckham said the two have a date to appear in court next Thursday. PETA said in a release that 30 cats a year at UW-Madison are starved, deafened and decapitated for brain research that hasn’t done accomplished its goals of improving human hearing. Eric Sandgren, director of the Research Animal Resources Center on campus, said in an email that PETA’s claims are false, and that the USDA has conducted independent examinations that came to the same conclusions. Cromwell said in a telephone interview that he was shooting a television series in Philadelphia a few weeks ago when PETA asked him to do the protest. He has been working with PETA ever since he made the movie Babe, and PETA contacted him about helping to save 4H pigs from slaughter. 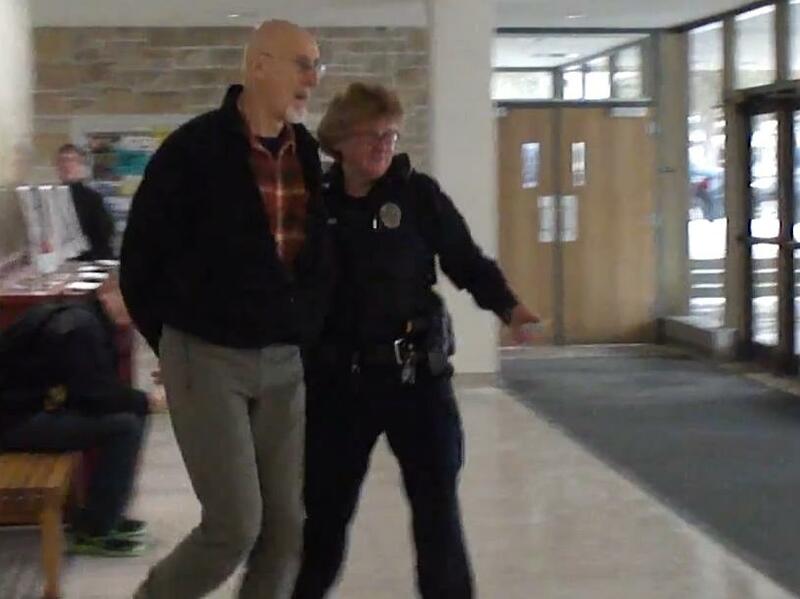 Actor James Cromwell, PETA official arrested at University of Wisconsin System Regents meeting.